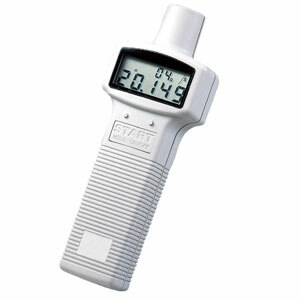 The HHT-1500 Series is an accurate economical, non-contact optical digital tachometer. All units come complete with reflective tape and carrying case. An optional contact adaptor, HHT-1502CA is easy to attach and converts the unit to mechanical measurement. Users affix a tape on the shaft to be measured. The tachometer measures the time between reflected pulses of light and calculates the RPM. 참고: Each unit is supplied with carrying case, reflective tape, 4 AA alkaline batteries and operator’s manual.